Want an excellent, totally playable keyboard? Don't want to spend a ton of cash? 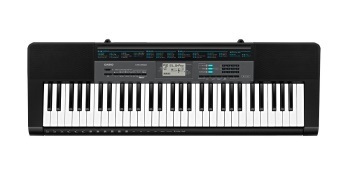 Check out the Casio CTK-2550 digital keyboard! This rocking' little keyboard comes with a ton of amazing onboard sounds and great playing features. Even if you've never touched a keyboard before, the CTK-2550 is a great instrument for you. It's got a cool 3-step learning system, plus 400 inspiring sounds to play with. You can even create your own dance music using the Dance Music Mode. Want to rock out with some tunes? The CTK-2550 comes with 110 built-in songs. What's more, you can hook up your tablet and connect to the Chordata Play app and learn how to play all the songs you love by downloading the MIDI file. Talk about a killer deal! Order your Casio CTK-2550 portable keyboard today.